If you are flying premium, business, first on an international trip (you are in another country setting out to return to the US or travelling around abroad) — you get a security bypass card automatically for your status. Some agents are sloppy and do not mention this to you. ASK. You need it for each leg of the flight, so if you have a stopover, make sure you get one for each leg. Show it to security and you will get expedited even if you are not an elite member of the airline you are flying. If you are flying business or first, you will get a free voucher to use the club lounge for your class automatically. Again, ask. You will not get it domestically for domestic legs of your flight (so, no free club lounge if you fly from NYC to SFO first class). But if you have a first class leg out of SFO to another country, you can get a free club lounge pass, so this is another reason to come early to enjoy the bennies. Some airlines and airports offer special customs/passport check bypass lines. I discovered that in the Dubai airport (and a couple other UAE locations), there’s a service called Maharba that will spare you the torture of the passport line and fast track you past the other hundreds of people milling around in confusion. In a large, confusing airport, services like these can be especially useful if you don’t speak the language and you don’t want to be treated 1) poorly by passport officials who don’t like you because you’re foreign 2) like you have 24 hours to wait in a passport line. Families can use it when they need quick transport from gate to gate and have toddlers and babies in tow, the elderly can use it, or people who want to avoid the hassle and be more efficient can, too. 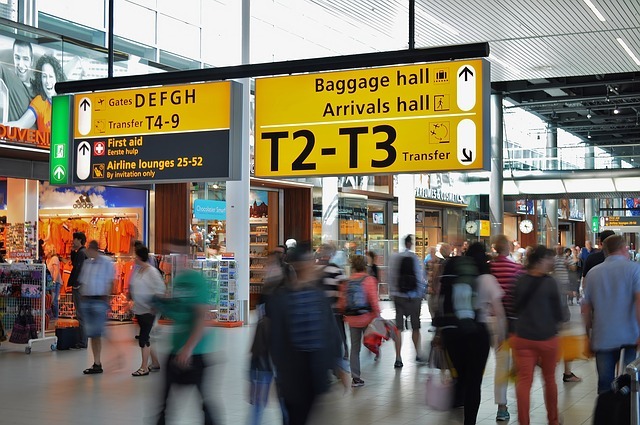 If you are not using a special service to fast track you through customs/passport check — GET OFF THE PLANE ASAP and book it to the passport line. I am not kidding. Pee before you get off the plane. I was dumb once and went to the bathroom after getting off the plane, then when I got to the passport line — 200 people. Russians knocking over Germans knocking over Koreans, etc., trying to get through Incheon’s “transfer” lines which had not nearly enough people manning it for 6 planes all deplaning their passengers at the same time. Everyone was literally elbowing and fighting and shouting, NO BUENO. Do not dally. If you are able-bodied, and not weighed down with children or whatnot, BOOK IT to the passport line to spare yourself serious pain. This is also why you should make all your international connections a minimum of 2 hour layovers so you don’t risk missing a flight.